Pierre Charles L’Enfant was born on this day in 1754 at Anet, Eure et Loir, France. Today is the 258th anniversary of his birth. L’Enfant was educated at the Royal Academy in Paris as an engineer before joining Lafayette to help the American side during the War of Independence. He arrived in 1777 at the age of 23 and fought as military engineer. He joined George Washington’s staff after recovering from injuries at the Siege of Savannah. He attainted the rank of Major of Engineers in 1783. He moved to New York after the war and established a civil engineering firm. 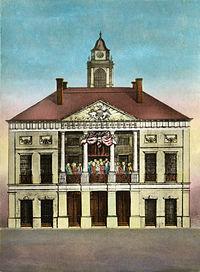 In 1788 he redesigned the New York’s city hall to be the United States’ first capitol building, Federal Hall. The building was the site of George Washington’s inauguration and where the Bill of Rights was signed. In 1791 the US Congress authorized the building of a capital city on the Potomac River. 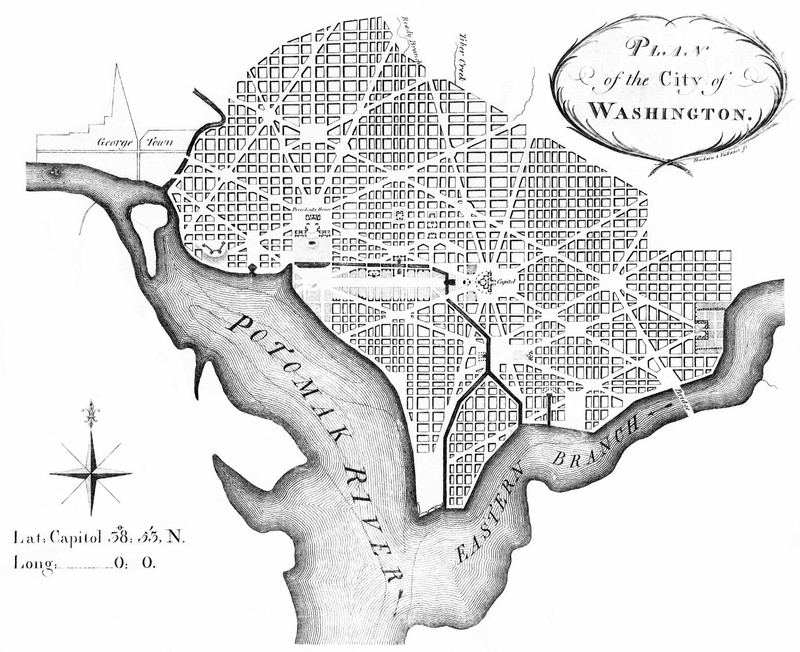 George Washington appointed his old friend L’Enfant to design the new city in 1791. “Congress House” (the Capitol) was to be on top a hill, a place of honor overlooking the rest of the city. The “President’s House” (the White House) was to be a grand mansion fit for the leader of the country. His plan outlined the need for public spaces including a grand public walk (today’s National Mall) ). It would be 1 mile long and 400 feet wide and would stretch from the Capitol to an equestrian statue of Washington (the Washington Monument is now where the statue would have been). L’Enfant placed Congress on a high point with a commanding view of the Potomac, instead of reserving the grandest spot for the leader’s palace as was customary in Europe. Capitol Hill became the center of the city from which diagonal avenues named after the states radiated, cutting across a grid street system. These wide boulevards allowed for easy transportation across town and offered views of important buildings and common squares from great distances. Public squares and parks were evenly dispersed at intersections. Wide avenues and public squares would make it “people’s city”, while monuments and inspiring buildings would give it the stature and importance of world capital. While he was concerned with the grand vision of the city his bosses on the Congressional appointed committee were concerned with how much the project was going to cost . They wanted to keep the wealthy plantation owners in the area happy. L’Enfant “delayed producing a map for the sale of city lots (fearing real estate speculators would buy up land and leave the city vacant).” And he angered the commission when he had a prominent resident’s house torn down because it was in the way of one his boulevards. When the city’s surveyor went behind his back and produced a lot map L’Enfant resigned. He was never properly paid for the work he did on the Capital. The city was built, but the design had been greatly altered. Gone were the arrow straight streets and parkways. The Mall between the Capitol and the White House was a tree-covered park of irregular shape. Cows grazed on it. Visitors ridiculed the city for its idealistic pretensions in a bumpkin setting and there was even talk after the Civil War of moving the capital to Philadelphia or the Midwest. But in 1901 the McMillan Commission resurrected L’Enfant’s ideas and updated them for a modern city. The Mall was reclaimed, cleared and lined with American Elm trees. Memorials to Lincoln and Jefferson were added, and Museums and government buildings lined the perimeter. after the Capital, but non were very successful. His design for Philadelphia millionaire Robert Morris’ mansion was called Morris’ Folly. His final years were spent at the home of his friend William Dudley Digges, near Bladensburg, Maryland. 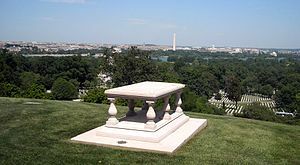 He was buried there, but his body was exhumed and reinterred at Arlington National Cemetery with full military honors. His tomb now overlooks the city he helped design. This entry was posted on Thursday, August 2nd, 2012 at 3:29 am	and tagged with Pierre Charles L'Enfant and posted in American History, Architecture, Gardens, History, Maryland, Non Fiction, Patriotic, postaday, Thought of the Day, Today's Birthday. You can follow any responses to this entry through the RSS 2.0 feed. I often mix my poetry with my love of history. Believe I or not, said mixing resulted in a book. If you have time and the mind to, check I out. Here is a link. Thank you. Read it. Let me know what you think. All the best.